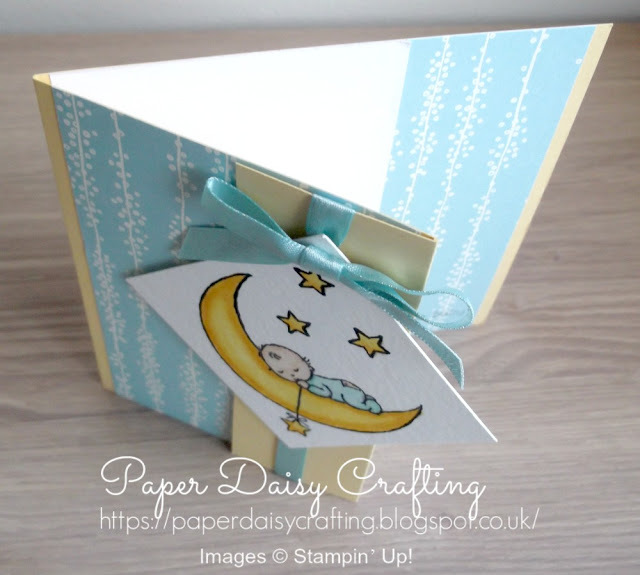 Paper Daisy Crafting: Handmade Moon Baby card from Stampin' Up! Handmade Moon Baby card from Stampin' Up! So pleased you've decided to join me again today. I'm still in "catch up" mode - I have so many projects piled up to show you. I'm trying to post every day in March so that I can get to the bottom of the pile! As you might have realised, not all of the projects I am showcasing were made by me. 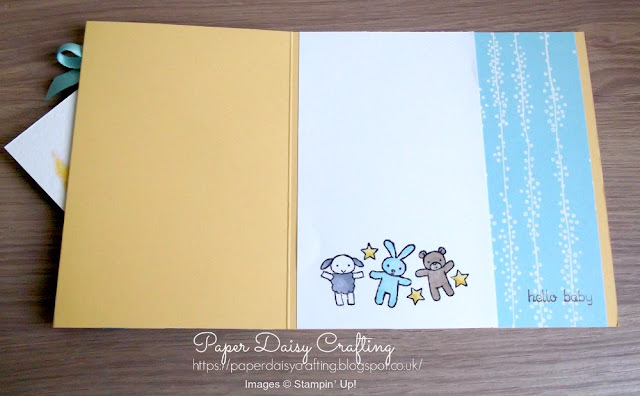 I've been part of so many "swaps" over the past few months that I have some lovely cards to show you made by fellow demos. However, today's card is one of mine! I'll let you into a secret - I do not actually own this stamp set, but this card was made as a "Make and Take" at one of our team training days. The event was actually several months ago but I've only just found time to finish it, photograph it and blog about it. Thank heavens for the "snow days" we've had over the past week. Has given me some much needed time to catch up! And having made the card, I have fallen in love with this set - ah, well, yet another set to put on my wish list!! I'm not sure if you can tell from the photos, but I have used some "Wink of Stella" on the moon to add a little sparkle! I'm not sure you can see how the card was made from the photos above so here is one taken from a different angle which I hope will help. Hope you like my project today - now I'm just waiting for anyone I know to have a new baby so that I can put the card to good use!